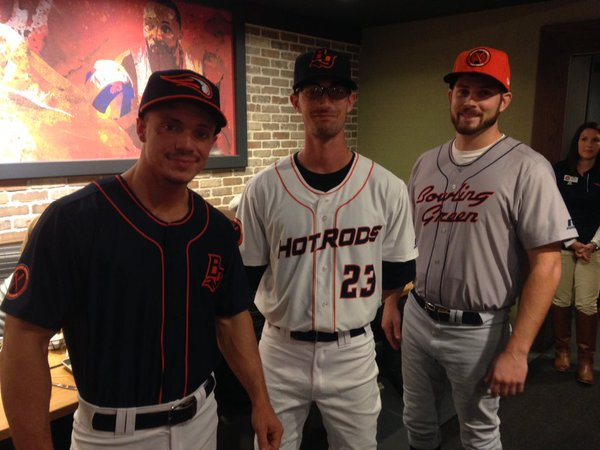 The Bowling Green Hot Rods unveiled their new logos and uniforms Thursday evening. This is the first rebranding for the seven-year-old franchise, which joined the Midwest League in 2010. The team’s primary colors change from red and yellow to orange and blue, which Hot Rods general manager Adam Nuse explained in an interview with MiLB.com. Blue is also the primary color of Bowling Green’s parent club, the Tampa Bay Rays. The Hot Rods have been affiliated with the Rays since their inception as a South Atlantic League team in 2009. The new Bowling Green Hot Rods logos unveiled Thursday evening. The new primary logo is a circle containing [the words] “Bowling Green Hot Rods” in the outer circle, while a redesigned “BG” mark is the focal point. The “BG” mark has been updated, removing the tailpipe flames from the top of the “B” as it was featured in the old logo, to where it is now featured on the bottom of the “G.” The new flames are also more arched and curved to depict the rolling hills of South Central Kentucky. The new primary logo will be accompanied by four alternate logos and two new wordmarks used on the jerseys. The previously described “BG” will serve as the team’s ligature mark. The iconic Hot Rods car has been revamped into a sleek new street rod. A baseball inside a tailpipe flame will serve as the secondary logo for the team. And playing off the design of the primary logo, the new patch logo features the same outer circle design with a cross wrench and bat design in the middle. The Hot Rods’ home wordmark features sleek tailing letters and is designed in an upward motion. The new road wordmark features Bowling Green written in stylistic lettering representative of the original Corvette. The Hot Rods are the second Midwest League team to unveil new logos and uniforms this week. The Kane County Cougars did so on Tuesday, which you can read about here. This entry was posted in Bowling Green Hot Rods, Kane County Cougars, Midwest League, South Atlantic League. Bookmark the permalink.